“Skyscrapers on one side, Canada on the other, Class Bravo airspace above, and an international shipping lane below. Cool! Let’s put on an airshow!,” said Steve “Dogbag” Tupper, the Air Boss, or overall commander of this year’s Detroit River Days Tuskegee Airshow. 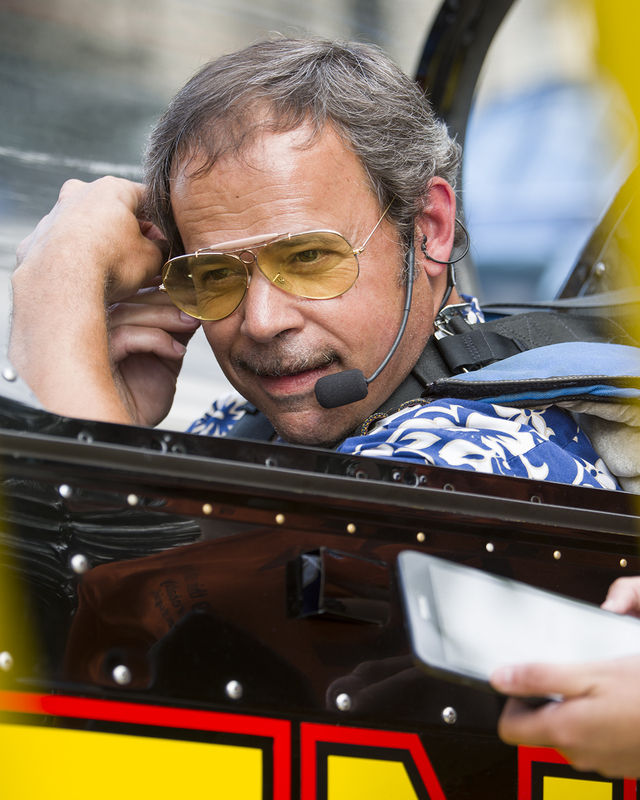 Tupper is a FAST qualified lead pilot and one of the driving forces behind the show. 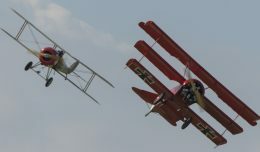 While the show is off the radar of most aviation enthusiasts, it has a unique distinction of being held in one of the most complex pieces of airspace of any show in the country. 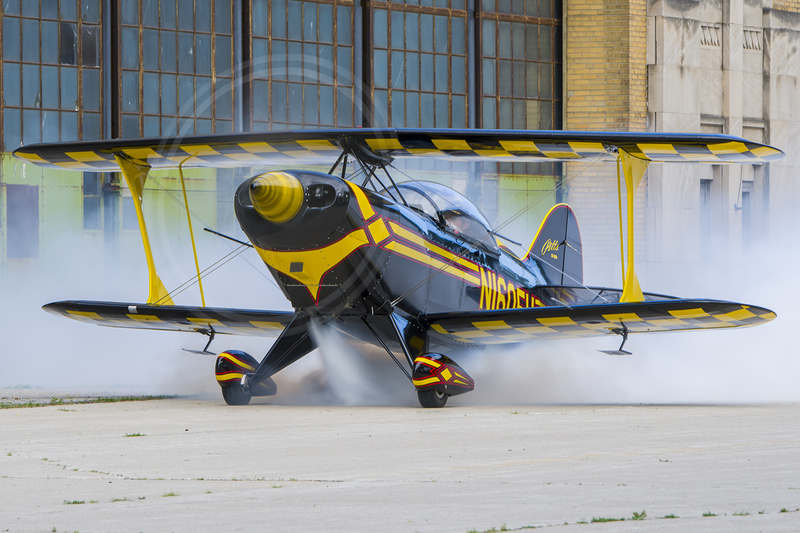 NYCAviation had exclusive access to peek behind the curtain and witness the time, dedication, professionalism, and a dash of fun that went into putting on the 5th year of a surface-waivered airshow over the Detroit River. This means that the FAA has approved a safety and maneuvering plan that allows aircraft to fly closer to people and objects than normally allowed by regulation. Micro Boss keeps a close eye on Air Boss as all the necessary equipment is removed from the Mk I BBOR (Big Bag of Radios). In a few hours, airplanes would be zipping over the Detroit waterfront, but for now, all of the action was taking place in a small conference room at Detroit City-Coleman Young Airport. 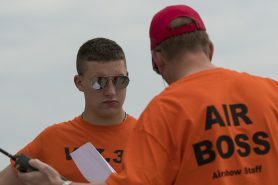 The Air Boss and his staff were briefing the day’s events to pilots, ground crews, control point staff, announcers, safety observers, FAA representatives, and a lone NYCAviation photojournalist. In the 45-minute session, questions were answered, procedures clarified, humorous moments shared, and safety stressed. As the overall commander of the show, the Air Boss made sure every eventuality was planned for, from lost comm procedures, to traffic flow and forced landing locations. A USCG 45 foot RB-M from Coast Guard Station Belle Isle served as the center maker for the show. 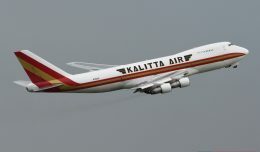 Many airshow fans are familiar with the fact that performers often show up at least a day or two prior to the show and usually fly practice flights and do any required media engagements. Less familiar aspects of the pre-show preparations include the “petting zoo” for members of the safety and rescue teams. Generally this involves a quick run-through of any peculiarities of canopy operation and hazards on the aircraft with the airport’s fire department, but performing over a river adds yet another wrinkle to the planning. While Detroit’s population and building density falls well short of what is familiar to residents of NYC’s boroughs, “The D” remains a heavily populated city and what little green space there is tends to be a gathering place on a warm summer afternoon. 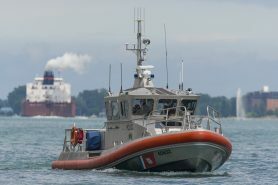 Accordingly, the preferred forced landing area was the Detroit River itself, and a team of divers from the Detroit Police Department were standing by. The divers attended the petting zoo safety briefing as well and were able to get hands on experience with the aircraft’s canopies and restraint systems to ensure they’d have a good chance of extracting an aviator from a sinking aircraft. 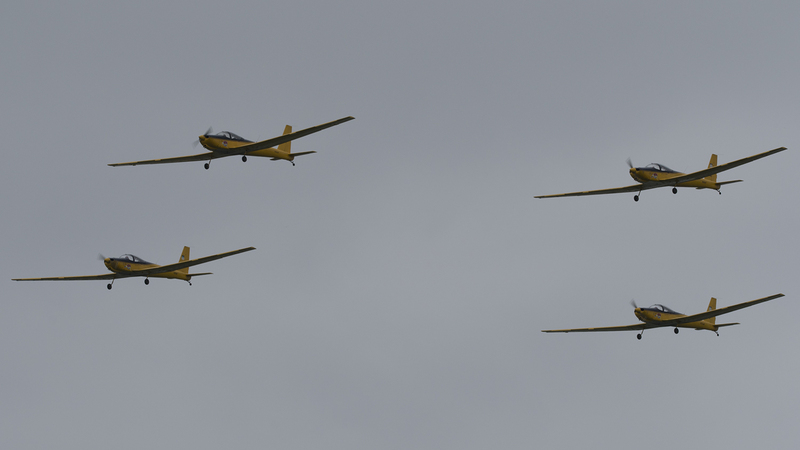 The T-6As from Columbus opening the show with a flyby. The River Days festival first came to the Detroit waterfront in 2007 as an event meant to highlight the revitalization of the waterfront with a riverwalk and public space. In those days, the airshow did not yet have the FAA waiver, and consisted mostly of flybys by museum aircraft and other planes that had to stay 1,000 feet above Detroit’s tallest building, meaning the airplanes could not be lower than 1,700 feet above the ground. In 2013, the first serious effort at an airshow was made, and each year it’s become bigger and better. 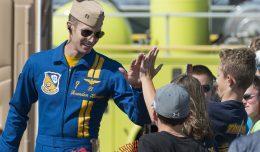 The airshow is a small part of the weekend festival that includes a carnival, countless musical performances, tours of military watercraft docked at Port Detroit, and the annual Freedom Festival Fireworks. 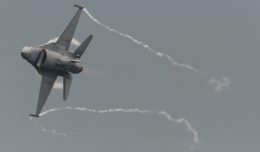 This year’s show featured six performing acts in addition to Friday flyovers by a flight of four T-6A Texan IIs from Columbus AFB in Georgia and a pair of A-10C Warthogs based nearby at Selfridge ANGB. Airshows take place in a “box” of protected airspace. This gives the performers free rein of a piece of the sky without interfering with any other air traffic, and keeps that other air traffic safe from the performers. 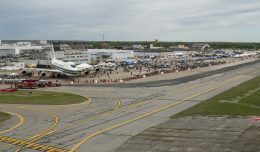 The protected airspace for this year’s show was kept to a 3-mile radius and a maximum height of 3,000’ to avoid impacting Detroit City airport, where most of the performers flew from, and more importantly, the thousands of passengers flying Delta and other airlines to and from Metro Airport to the west of the city. While there was a 3-mile radius of protected airspace, the performers did not use that whole 3-mile circle so as to avoid any unintentional international incidents. That’s because the Detroit River divides the US and Canada, with Michigan on the north and the city of Windsor, Ontario on the south, so to keep things simple with regard to procedures and paperwork, the performers were given strict instructions to stay out of Canadian airspace. Airshow announcers often speak of passes made at “Gopher Scaring Altitude”. In this case I think the fish are the ones getting a bit of a shock. Being in the middle of an urban area, the show box had a few more complications to it. Skyscrapers line both sides of the river, with the tallest being the 720-foot central tower of Detroit’s Renaissance Center. The buildings disturb local airflow, creating turbulence that can affect the performances, and they also block radio signals, which operate on a line-of-sight principle. To solve the communication problem, a radio relay team was stationed at one end of the box outside of the radio shadow of the buildings to help coordinate between the Air Boss at show center and the performers taking off from City airport six miles away. The show staff were also connected via a teleconference “ground net,” to maintain situational awareness for the performers, weather watchers, safety observers, and cues for the announcing team, known in airshow slang as “Bigmouths.” These extra layers of communication greatly increase safety as everyone is kept abreast of what is happening, and every single person has the authority to call “knock it off,” when all activity is halted for a safety reset. Water Boss and Mini Water Boss keeping an eye on a passing saltwater freighter. Safety extended to the ground underneath the show box, as well. 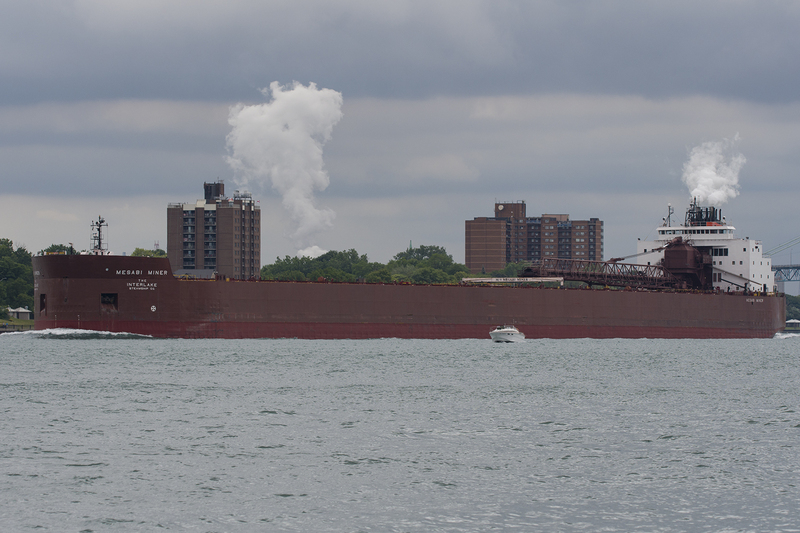 The Detroit River is a major international shipping lane, where Great Lakes and oceangoing fleets bring millions of tons of bulk cargo up and down the Saint Lawrence Seaway. 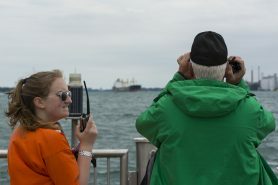 Enforcing a safety zone around the airshow box required the cooperation of the US and Canadian Coast Guards and the Windsor and Detroit police. Ships had to be kept 500’ away from the edges of the show box, with compliance monitored by a Water Boss, who had a direct line to the Coast Guard patrols and the Air Boss, who would call off any performances if the airshow box was fouled. 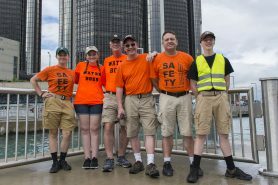 Control point staff from Sunday’s performance in front of the Renaissance Center. 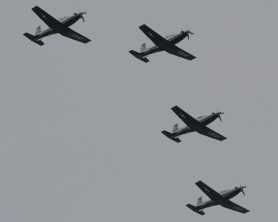 An additional team of safety and weather observers had their eyes turned skyward ensuring no errant aircraft or waterfowl would interfere with the show. Civil Air Patrol cadets from local squadrons were involved with observation duties, providing extra sets of eyes to help ensure the box was clear, as well as being exposed to the professionalism and dedication of the control point team and even getting some firsthand experience assisting the team where appropriate. When an overcast cloud layer rolled in, every available cell phone was used to get up to the minute weather updates from the automated weather observations at local airports to ensure the cloud base stayed high enough for performers to safely transit between City Airport and the show location in visual conditions. The team is fiercely serious come showtime and their reputation for professionalism is well deserved. 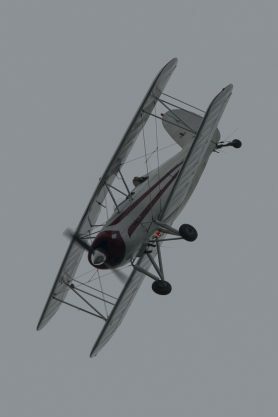 Paul Stambaugh flying his Great Lakes high over the Detroit River. 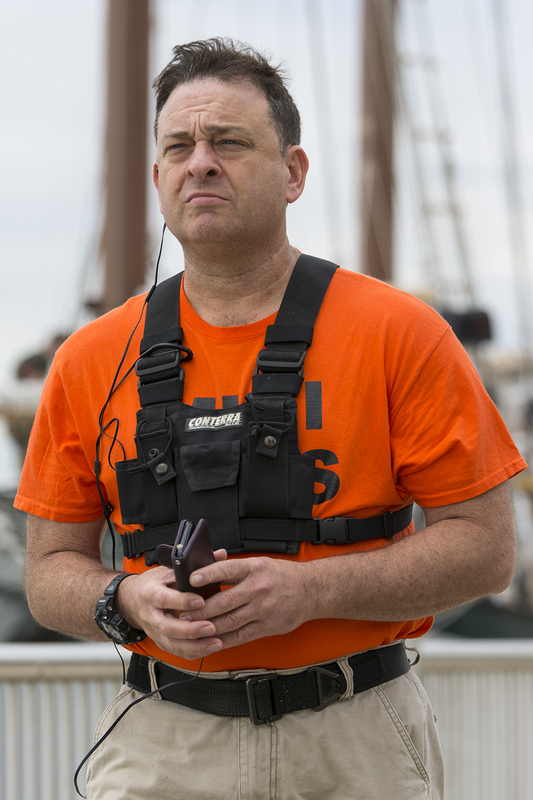 After the safety briefing earlier in the morning, the control point staff and announcers made their way to a pier jutting out into the river at the show location, and the performers got in the zone for the aviating that was to come. Given the non-aviation-focused audience below, everyone was advised to bring their A-game, but also to ensure no unnecessary risks were taken. 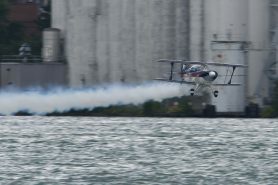 As the stated goals of no bent metal, reusable aircraft and performers, and, above all, spectator safety had been sufficiently drilled into the show participants, it was time for things to get underway over the Detroit River. With the airspace cleared, the water beneath the show box cleared, and everyone in position, it was time to take to the skies. 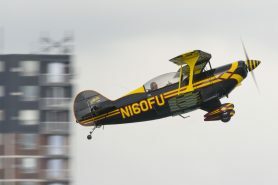 The show opened on Friday with a perfectly timed flyover by the Air Force’s modern T-6As, callsign TIGER FLIGHT, followed behind by Paul Stambaugh in an open-cockpit Great Lakes biplane doing a wind check to be relayed to the other performers. Paul’s routine was a call back to the old days, wowing the crowd who responded with cheers and craned necks. 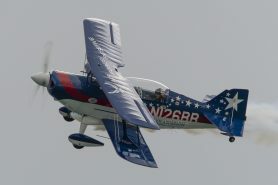 The spectators saw a tight turning performance that was able to stay mostly in front of the crowd, while the show staff saw the unsung skill of constant wind corrections in his light 1,800 pound aircraft and a show that was required by regulation to stay 800 feet over the river. 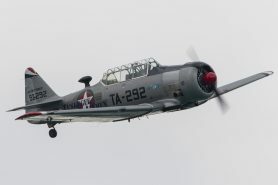 The Tuskegee Airmen National Museum T-6, flown by Dr. Brian Smith flying by the control point. 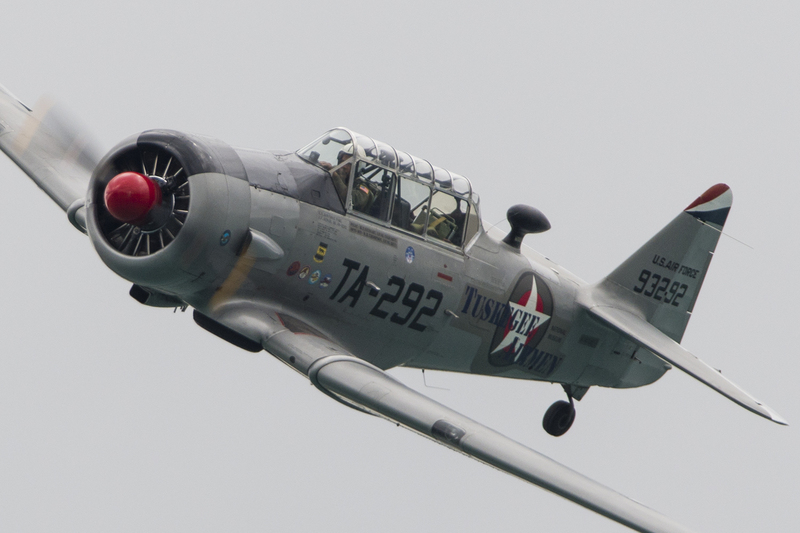 Next up were a pair of World War II-vintage T-6s. Priceless pieces of history, they are still airworthy over 70 years since they rolled off an assembly line. The lead T-6 was flown by Dr. Brian Smith, President of the Tuskegee Airmen National Historical Museum. This particular Texan was used to train the original cadre of Tuskegee Airmen during World War II. Flying off Dr. Smith’s wing was a variant of the T-6 built in Canada and known as a Harvard. The Harvard was brought to the show by the Windsor-based Canadian Historical Aircraft Association. 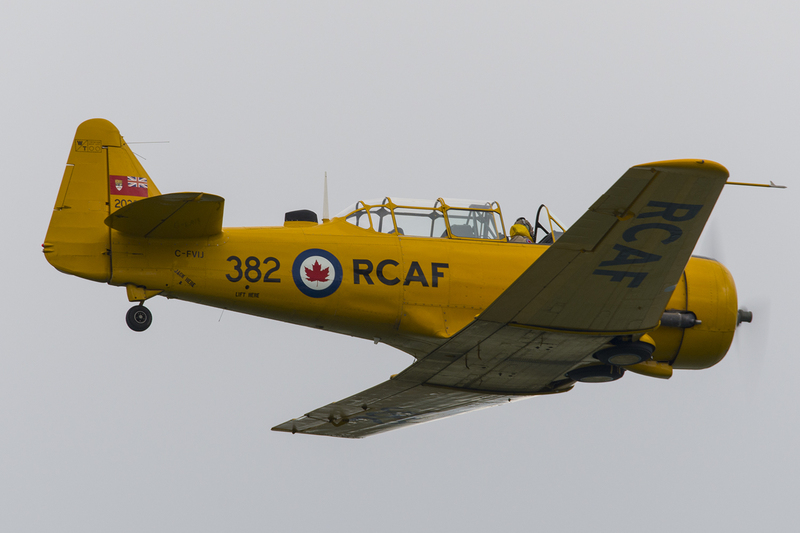 Their fleet focuses on World War-era trainer aircraft, and this plane wears the brilliant yellow liverƒƒy it wore in Royal Canadian Air Force service. The two round-engined trainers made flat and photo passes up and down the river, and represented the longstanding military cooperation between the US and Canada; an appropriate display given the show’s location on the border between the two countries. One last pass from Tico LaCerda took him down below the height of Windsor’s buildings. 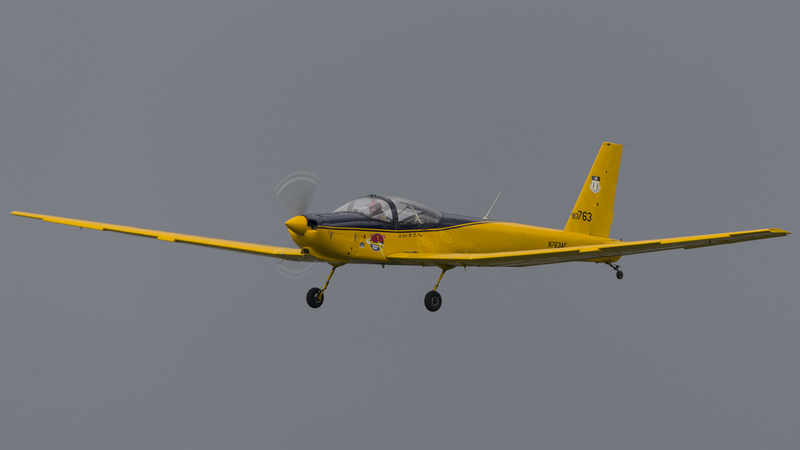 The Texans were followed by a Pitts S-2B, another aerobatic biplane. 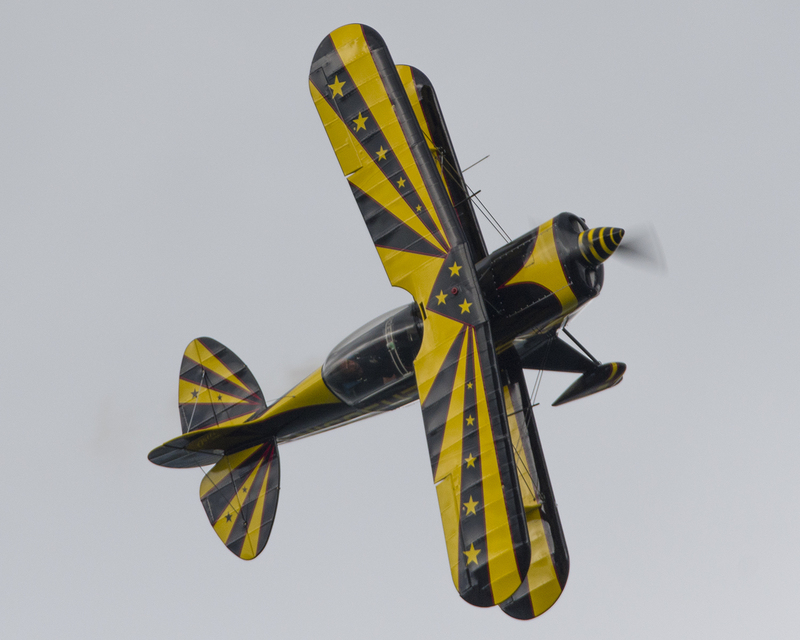 The black and yellow plane, flown by Robert “Tico” LaCerda, changed the noise from the low rumble of the T-6 engines to the high whine of a 6-cylinder Lycoming. 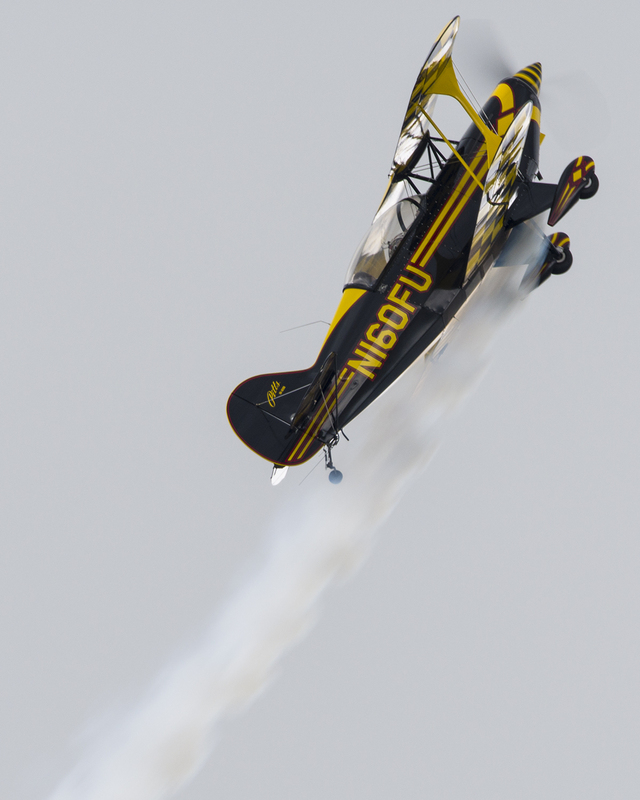 He dove in and showed off capability of a stock Pitts by carving precise aerobatic figures in the sky while trailing a full plume of airshow smoke. The performance finished with a couple of passes low enough to scare the fish in the Detroit River before exiting the show. From show left came another hometown performance, Team Tuskegee. 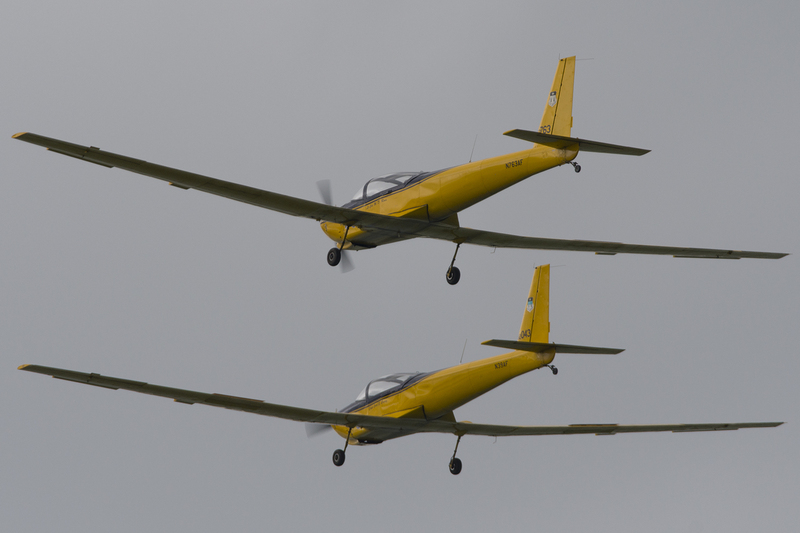 The team is made up of four Schweizer TG-7A (SGM 2-37) motorgliders, formerly used by the Air Force Academy. The gliders belong to the Tuskegee Airmen National Historical Museum, and are most often used to provide flight instruction and Young Eagles rides to kids from the Detroit area in addition to moonlighting as an airshow team. 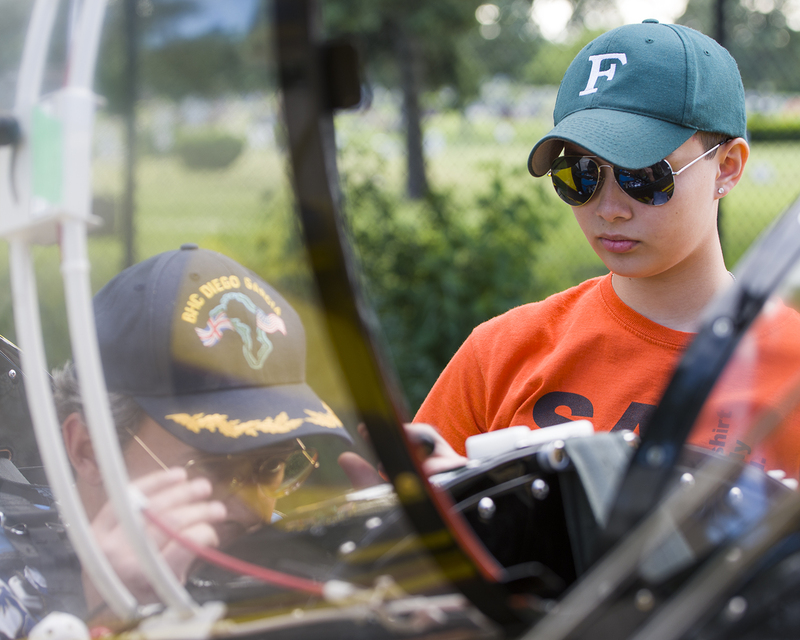 The pilots are all volunteers, formation qualified by the Red Star Pilots Association, and members of the Tuskegee Glider Club. 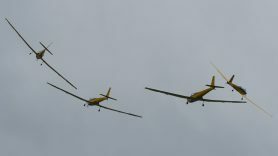 Only 12 of the bright yellow gliders were produced, all during the 80s and served as both glider and powered aircraft trainers at the Air Force Academy until 2003. 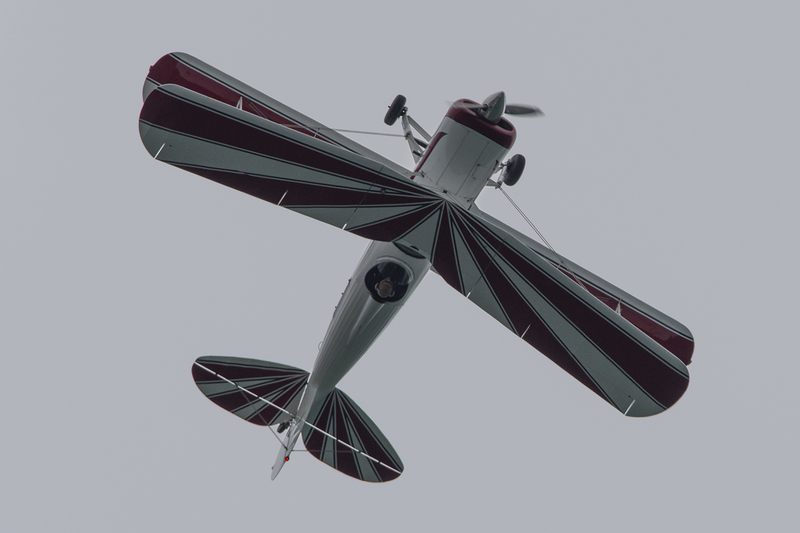 The “Franken-glider” was a low cost manufacturing effort, combining the engine and cowling of a Piper Tomahawk airplane with the wings and tail adopted from conventional gliders. 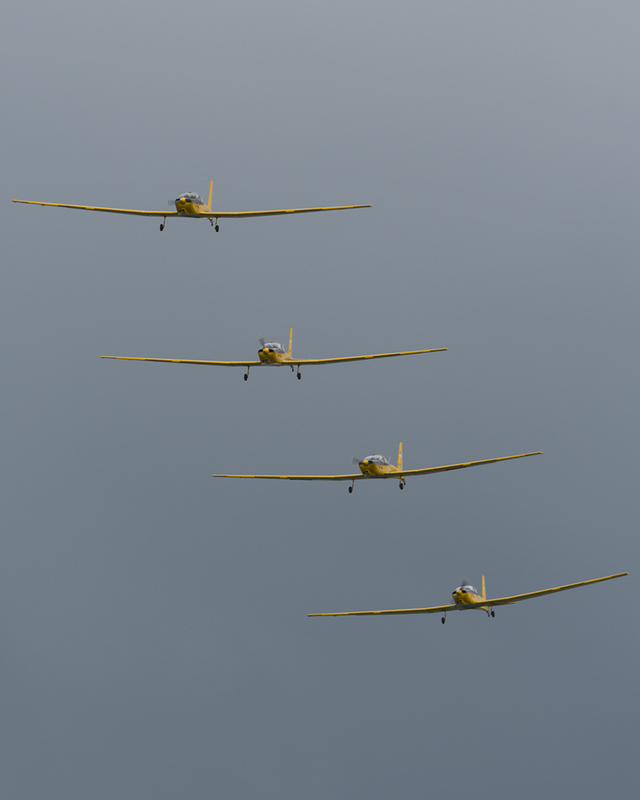 With a nearly 60-foot wingspan on each of the TG-7A’s, Team Tuskegee has one of the widest formations in the airshow business, particularly when the four aircraft come by in a diagonal echelon formation. The job that the team’s pilots do to maintain position is nothing short of astounding when one considers how difficult it is to fly the long winged birds precisely in turbulent air and without the horsepower that can be used for fine maneuvering. The team primarily flew a number of formations finger four, trail, echelon, as well as a few two-ship element maneuvers. 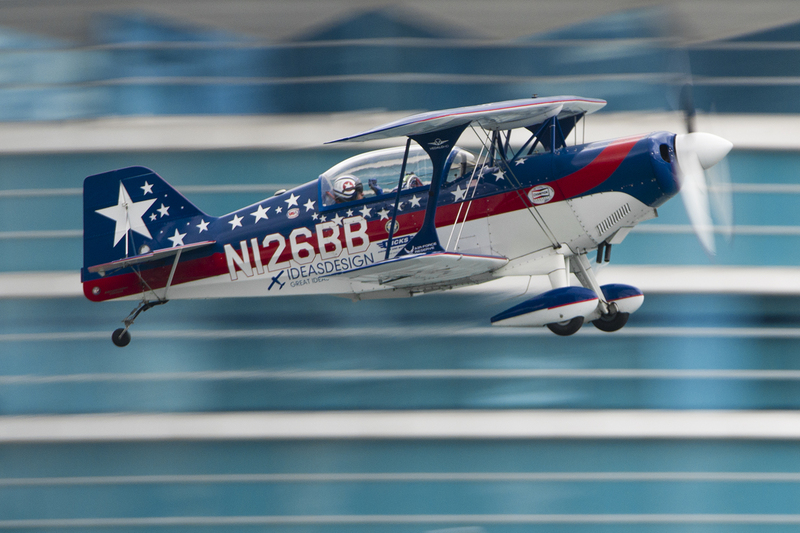 It is truly a treat to see a different kind of hand flying skills on full display in contrast to the high energy maneuvers of the aerobatic aircraft as the practiced hands of the Team Tuskegee aviators strutted their stuff for their hometown crowd. A topside photo pass from Billy Werth. 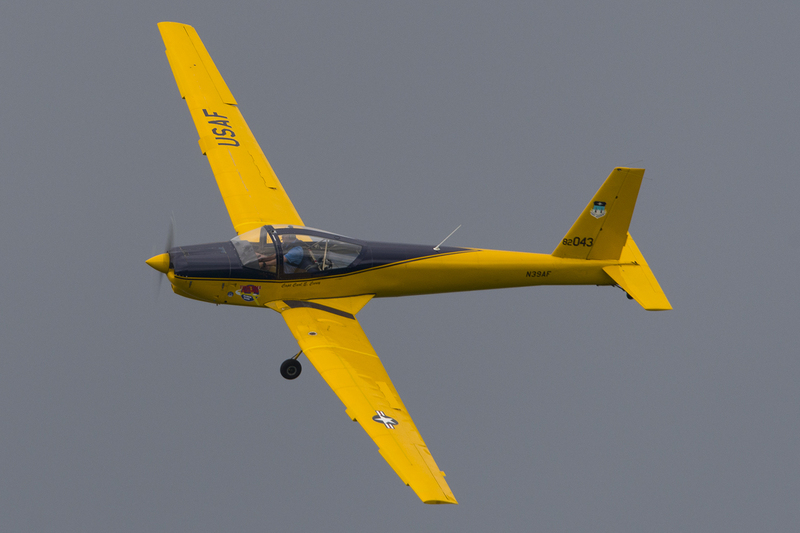 The last performer was Billy Werth in his Pitts S-2C, sponsored by the Air Force Reserve. Billy is an airshow industry veteran, flies airliners as his day job, and is also a KC-135 pilot in the Air Force Reserve. 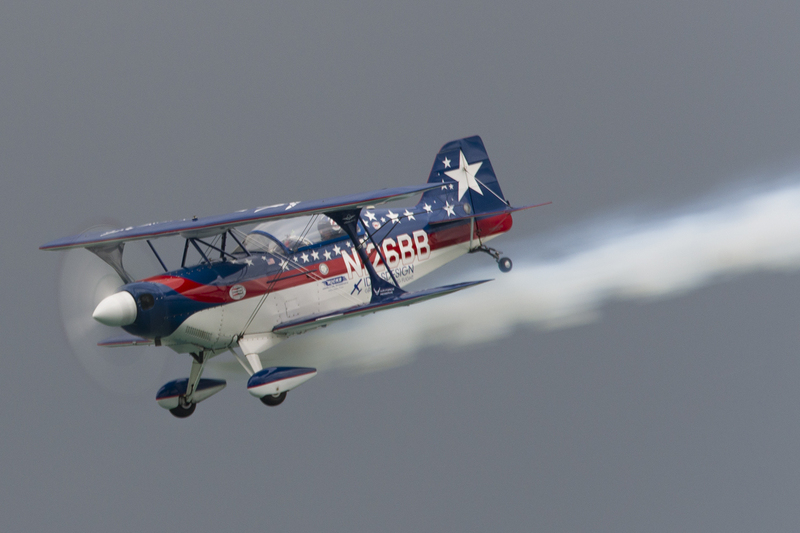 His experience flying the Pitts is evident throughout his demonstration throwing the red, white, and blue biplane around the show box with crisp rolls, pulls, and tumbles being the order of the day. 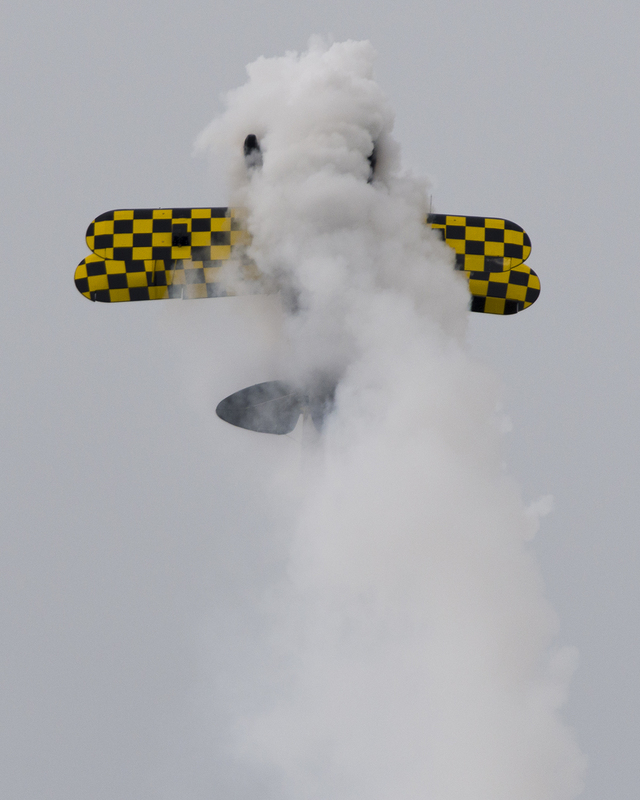 Trailing plumes of brilliant white smoke, and backed by the buildings in Windsor, Billy closed out the show with a great energy level and really gave the spectators something to talk about as he closed out his performance with a tailslide maneuver right on the deck. Two A-10C’s from the 107th Fighter Squadron perform a flyby at the end of Friday’s show. Friday’s performance was extended in the form of an additional hometown act. 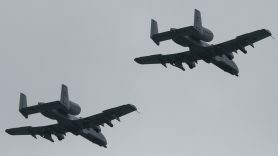 Two A-10Cs belonging to the 107th Fighter Squadron from the nearby Selfridge Air National Guard Base performed a flyover prior to the end of the show. It’s always great for the hometown heroes to have an opportunity to strut their stuff in front of their community, and the Selfridge A-10s were a great tie in with the modern frontline Air Force. This article only scratches the surface of what goes into making an airshow happen regardless of the complexity of the airspace. The author would like to thank Steve Tupper and his team for their hospitality, friendliness, and effort in putting on this display. Additional thanks are owed to the Tuskegee Airmen National Museum for their part in putting on the show, and for allowing an avgeek to explore their small corner of Detroit’s Coleman Young airport that is filled with more history than one would ever expect out of a sleepy inner-city airfield. This week on Friday Photos, we highlight the photos of new user Michael Wass. Plus, Ben Granucci shares some rare catches.